The act of buying a car sounds easy enough. 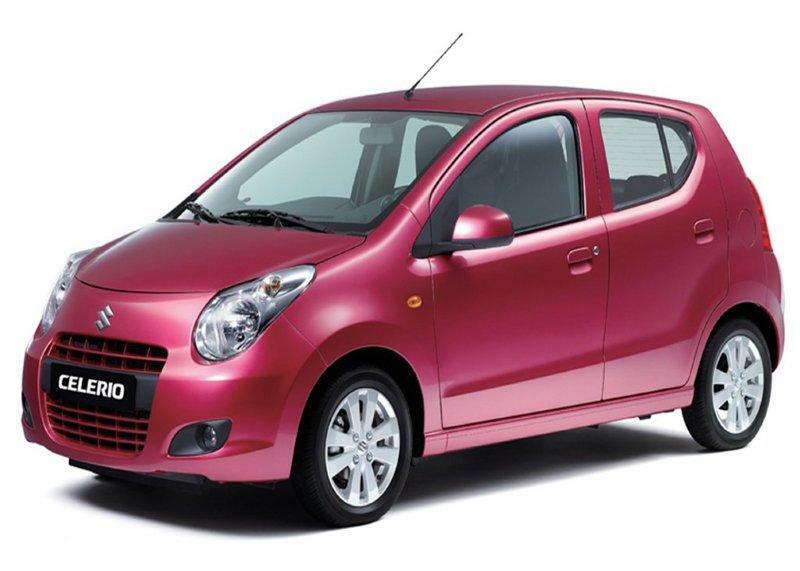 You figure out what kind of car you like, what you can afford, test drive it, and voila you have a new ride. Personally, I have never found buying a car to be a simple task. One of the reasons is because I know quite a bit about cars, and often having knowledge of what's wrong makes it more difficult to find an acceptable vehicle. I have never gone to school for mechanics, but growing up on a farm with continually broken cars meant that if I wanted to drive somewhere, I learned to repair it first. When it came to finding a decent car on St. Kitts, I was in for a long and frustrating debacle. In the U.S. a person usually decides whether they want to buy a used vehicle or a new vehicle. The new vehicle route is usually a losing situation unless you drive it into the ground like my family does. If you go the used vehicle route, then you may be considering a car that's nearly new, in the middle tier, which usually means a sticker price of ten thousand, in the five to ten thousand dollar range, or the junker. In St. Kitts I found out that price certainly doesn't correlate to quality. Buying new here is out of the question for us for many reasons. First, a new car here is super expensive because of shipping costs, inflated prices, and the 17% VAT you have to pay. For instance, this is what you get for $21,000 USD not including tax. It's not exactly a sports car, and with roads that are potholed like Swiss cheese, it's not very practical either. A brand new Toyota Camry runs around 62,000 dollars! That seems crazy. So we decided to buy a used car. 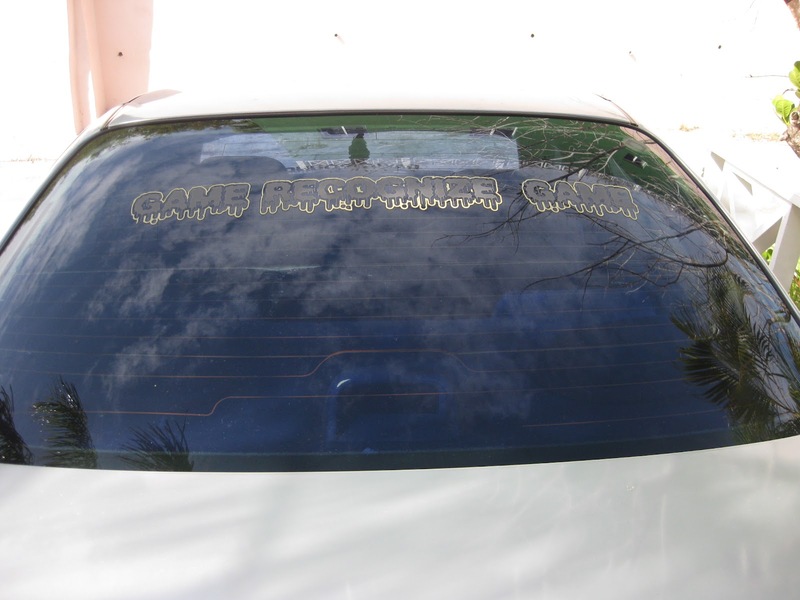 There are tons of used cars on St. Kitts, and with a new semester of students coming in every four months, cars get passed on like second hand clothing--but in worse condition. Used cars here are a phenomenon all their own. "Island cars" all have their own quirks. St. Kitts is not a very big island, but it's roads are very steep, narrow, and twisty. The road to the Southeast Peninsula of St. Kitts, which has many of the beach bars and a lot of new development, in particular leaves a lot to be desired. Often one of a used car's selling point is "will go everywhere on the Island including the hills of the Southeast Peninsula." It's a valid characteristic, yet in the U.S. I have never had to ask if a used car can make it up a hill. This one? The Jurassic Park Car? Or This One? The Cow Car? Or this one? Wait that's not for sale. 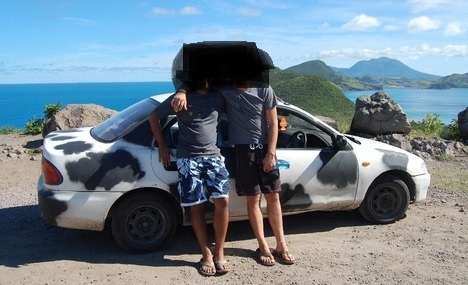 I started looking for a car within the first few days we arrived in St. Kitts. I looked at Ross University student cars and Kittian cars. In the first week I drove over a dozen cars. My first question of course would be, "So what can you tell me is wrong with the car?" The seller would then go over a laundry list of "quirks" about the car like: One or more of the windows won't go down or stay up. The A/C works but needs to be charged. I don't know what that rattle is, but I just replaced suspension parts. It leaks fluid from the [insert part of car here--feel free to be creative.] So on and on we went before I even drove the car to find out what the seller wasn't telling me or didn't know. On one particular test drive I couldn't get the car to move. The student owner took my place in the driver's seat to show me that you just had to floor the gas to get it up the hill, with the transmission slipping and engine screaming the entire way. Can you say "bad transmission"? A Kittitian gentleman had a beautiful, fresh painted candy apple red SUV that looked great in the pictures. It drove like a tank and clearly had no suspension left. I crawled underneath and within five minutes it had left a puddle of engine oil on the cement. Yikes! In this case don't judge a car by its paint job or looks. Then I found a diesel SUV. Diesels are much stronger and durable than gasoline engines. But when I coincidentally met and spoke to the vehicle's previous owner, I learned that she had sold the vehicle to the current owner for $2,500 after honestly advising him of its many mechanical faults. The seller only fixed the A/C and was asking $7,500 for the vehicle. I don't mind if people make a profit as long as it's not by selling me a lemon. The more I looked the more frustrated I became. I learned that in St. Kitts if you own a toolbox you probably consider yourself a mechanic. 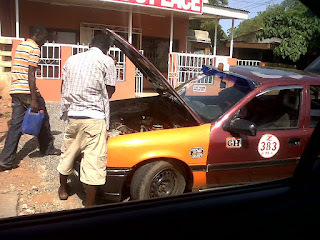 Not surprisingly, I found that some local so-called mechanics do more harm than good to cars then they fix. It's not unusual to take a car to a "mechanic" and not see it for six months. If you're particularly unlucky, you may find that in that six months rats have chewed all the wiring or the upholstery. Yikes. 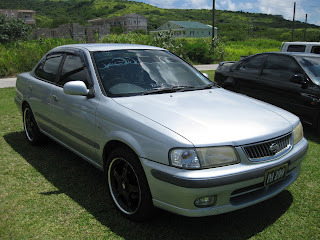 Finally, I found a young hard-working but laid back Kittian who was selling a 2000 Nissan Sunny. I prefer to buy a car from someone who is laid back, not someone who is always moving--and driving--at the speed of light. Julius had purchased the car online from Japan a few years ago and had it shipped here, which is great for two reasons. First, the car hasn't seen St. Kitts suspension ruining roads for long, and secondly, most have low enough miles that local "mechanics" haven't buggered them up yet. For $5,700, we had ourselves a deal. The windshield says "Dawg Pound"! Okay, maybe the car looks like something we found off of a gangster in south Chicago because of its 17 inch rims and tinted windows, but at least it's mechanically sound. My wife Julie dubbed it "Dawg Pound" because of the sticker it has on its front windshield. Dawg Pound sounds and looks great to me, literally and mechanically. Dawg Pound has about 70,000 miles, no leaks, and all four electric windows work. I recognize it's a mechanically solid car and for the money the best car I could find. I've found that this is the best car to assimilate onto the island with too. Everyone thinks I'm a local, so people flash their lights at me all the time. Obviously they recognize Dawg Pound's game. Besides, the seller was extremely helpful during the purchasing process which required us to go to four different places in town. He even helped me buy some car parts so I could service Dawg Pound's maintenance needs such as changing the oil and air filters, which I did myself in the driveway the next day. Bottom line: when you're looking to buy a car on St. Kitts be patient, know what you're looking for, and know that here price is not correlated with quality. Oh, and if you're unsure, bring it by so I can crawl under it first. Happy Island Car shopping! I can feel your frustration. 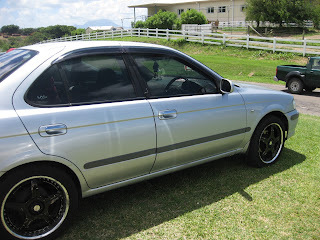 I also experienced buying an island car and it took me several days to finally make a decision. I also agree that patience is needed when buying an island car.